Here I go again with another off the wall site. This one is the top of the river bank that also serves as a sidewalk of sorts. I figured people have been walking this path on top of the bank for 100 years so there ought to be coins there. I hunted this site for a little bit the other day after work. I posted about it. 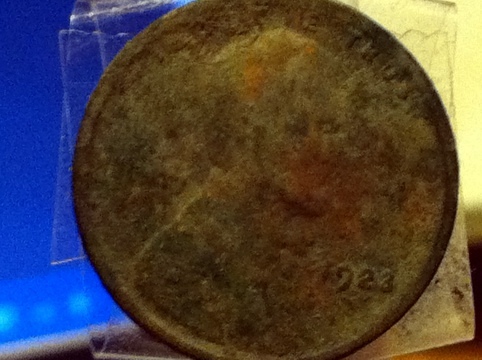 I went back today and hunted for a little longer and I found a 1924 wheat cent with no mint mark. I slowed down my pace and tightened my swings and found four memorial pennies from the early 60’s in the general area. There is a lot of ground to cover and I am sure there is silver in there. While I was digging a penny, a man approached me to ask me questions about the AT Pro. He is a fellow hunter and in fact, he was coming back from a hunt in the park next to this new site when he saw me. He was a very nice guy and after introductions I told him about the forum I hang out at. He hunts Riverside park and so do I so I am sure I will run into him again. What is that a man-hole cover? You should put a penny or something in the picture so we can see the size of that huge iron disk. Lol I’m kidding. Nice wheat! Always nice when they are before the 1940’s too.